Patina Moon: My Crochet Obsession and a Little "Lucy Love"
wanting to create more and more of? Each design is uniquely challenging for me. I love the thought of creating something pretty and lacy-like with thread. This is my first "Pineapple Doily." It's supposed to be 11 inches in diameter, after blocking. I'm still 5 rows away from finishing this piece! 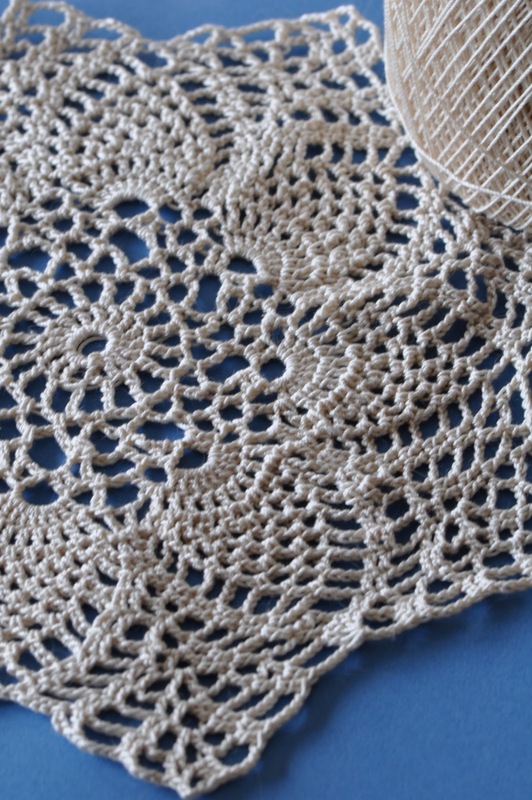 I am using AUNT LYDIA'S Classic Cotton Crochet Thread size 10. I enjoy working with the creams, white, ecru, and linen tones. I was inspired for hours looking at Dawn's beautiful creations. 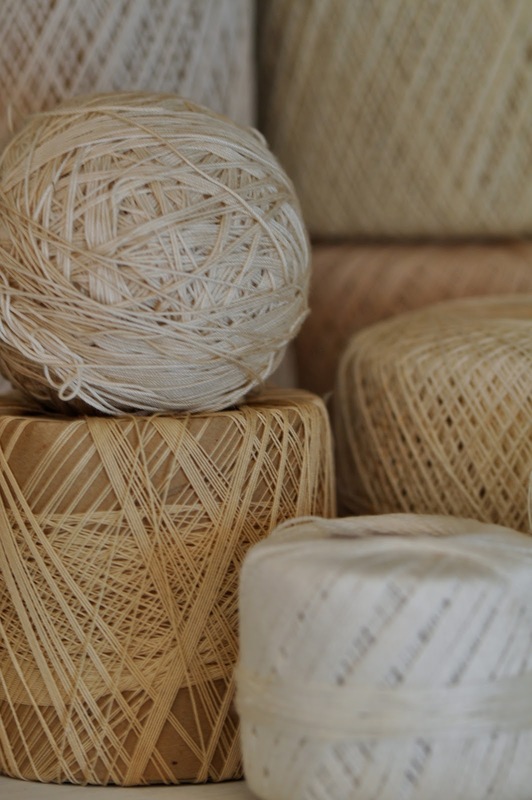 I say, you can never have too much yarn or crochet thread! Then, I discovered a fun book of unique Granny Squares. I already have a few colors of, so I thought I'd give it a try. 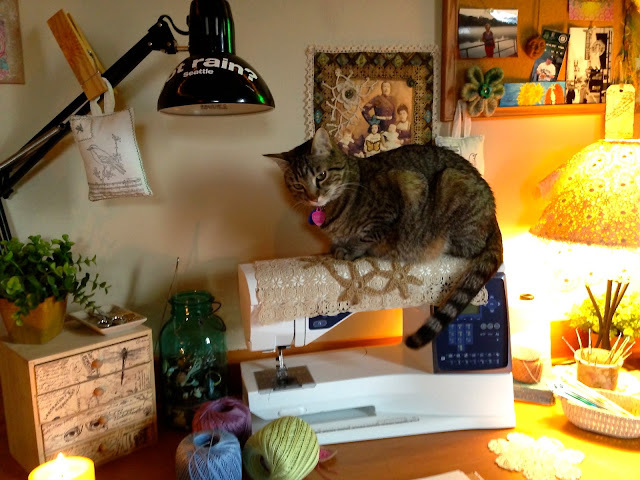 This lamp sits right next to my sewing machine. I threw this crocheted piece over it and loved the look. So, here's the "Lucy Love" part of this post. thought they were too fun not to share! crochet hook moving, that little paw starts going at it. she'll fall asleep again in my arms. I sure love the way it looks thrown over the lamp with the soft light coming through. It amazes me to see the intricate designs! I love the colorful pieces, too! Enjoy your week! What a little sweetie she is! 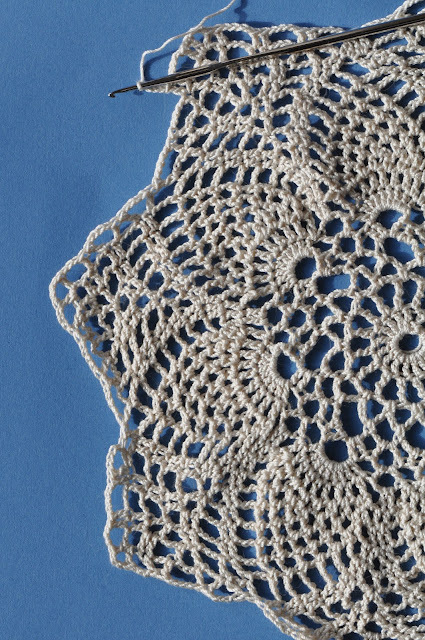 Love the crocheted doily. 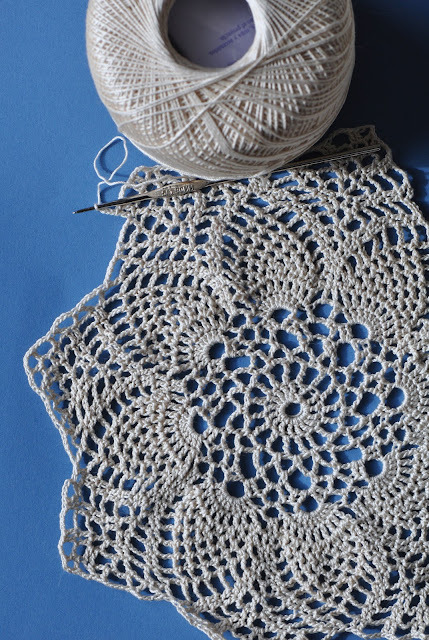 wowza...i am a big fan of crocheted doily's and yours are beautiful. lucy looks so cozy in your lap! 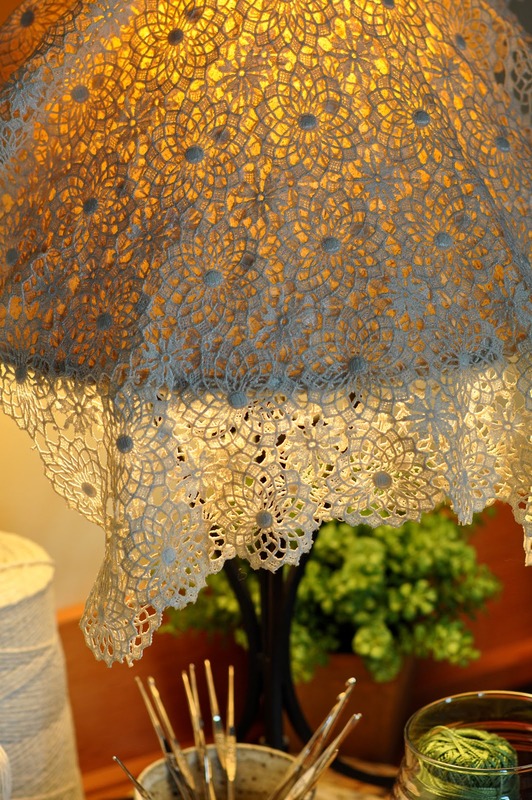 Love all the doily love!! And your cat is adorable. Oh Becca, she is absolutely adorable....and to fall asleep in your lap. Charming. I love that modern crocheters are branching out into more colors, it gives the beautiful handwork a nice fresh spin. Sweet kitty cat. Love your crochet pieces. 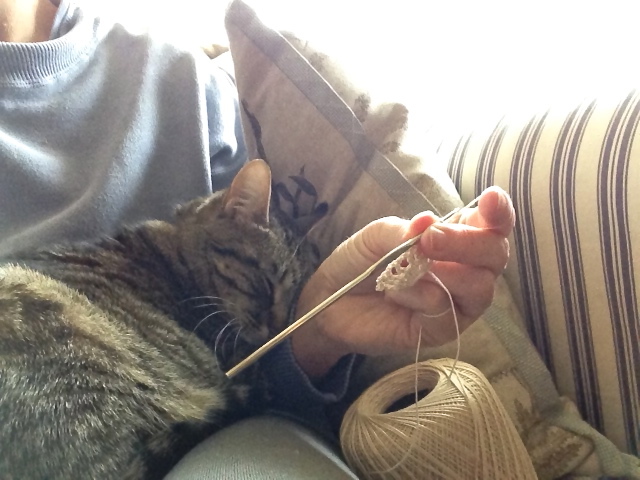 So sweet, Becca...you look so cozy crocheting with Lucy! You are really good at the crocheting now...such loveliness! Little Lucy appears to be a very good lap warmer. And I'm amazed that you can distract her from that thread! LOL! Hope you ate having a wonderful week Becca! Great projects, I like both the natural and brighter colours. Lucy is just so cute, I think I need to borrow her! Becca, the Pineapple Doily is absolutely gorgeous!! I cannot even imagine the amount of work (and patience!) that went into making it. I think Lucy enjoys your work too. What a precious one she is. Such lovely warm pictures here Becca...and Lucy cracks me up. On the sewing machine! Too funny. Reminds me of when I used to crochet a lot and my cats always went crazy chasing the yarn. Oh, my goodness, Becca!!? ?...Your blog is AMAZING! So beautiful. I love, love, LOVE your pineapples. But crocheting with Lucy?...well that just clinched it for me! Your pics with her (and your crochet) are simply --- well, I almost got teary-eyed when looking at them --positively lovely & breath-taking! You crocheters have been so inspiring - not that I'm trying it but it's getting into my decorating brain.